Typically you know that I love to support LLS, mainly through their annual Light the Night campaign. In the past 3 years, we have walked proudly with our team and our balloons. This year, due to some scheduling issues, we cannot participate. I still feel the need to give back to the cancer community at large and volunteer doing something helpful. When LLS contacted me about being an honorary captain (again) at the HEADstrong Foundation's Nick Colleluori Classic (Lacrosse Tournament), I was game. HEADstrong is a foundation started by Nick Colleluori, a lacrosse player at Hofstra, who passed away in 2006 from Non-Hodgkins. His passion was lacrosse and he came up with the idea to help raise blood cancer awareness and to aid families affected by the disease. 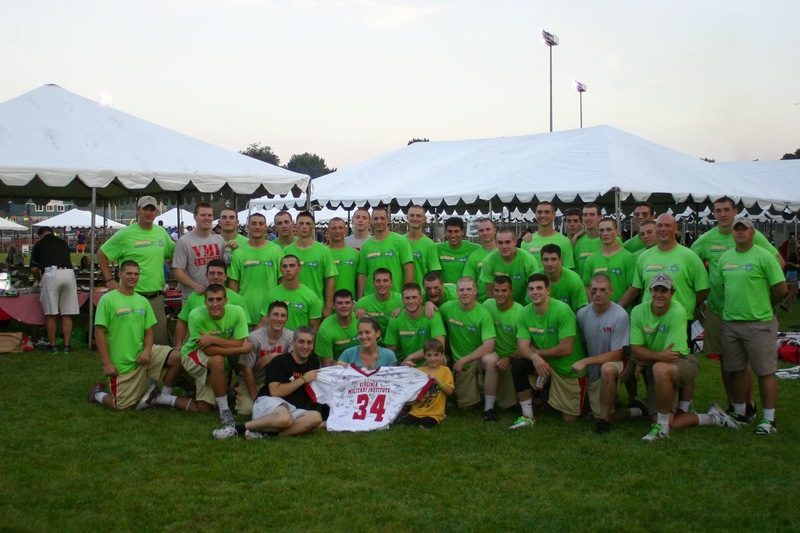 To date, HEADstrong has raised over $4 million towards their mission and their events continue to grow in success each year. The guys were great - we sat on the bench to watch the game, got to hear them cheer for each other (perfect for Judah as he works through issues of sportsmanship playing soccer), and see them WIN! But the most special part for me was discovering that prior to playing their second game, every player on the team had registered on our National Bone Marrow Registry. They were the only team to make such a commitment that day and I can only hope that the other teams followed their lead. 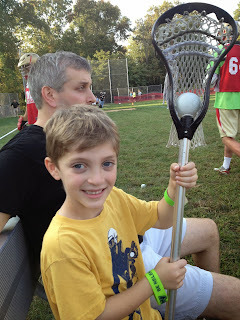 guess who wants a lacrosse stick for hanukkah? After the game, the team invited us back to their tent, where plenty of parents were waiting to congratulate and feed them (the love and pride was obvious). The coaches and captains presented us with a jersey signed by the team, hats just like the ones the coaches wore, and a special commemorative coin given out to the lacrosse players who go on to serve in one of the 4 divisions of the military. All in all, a very valuable and memorable experience. Cancer has definitely taken us to places we never thought we'd go. Some days have been very dark, but this was a bright spot for sure. Thank you VMI Lacrosse Team! Wishing you a great season.